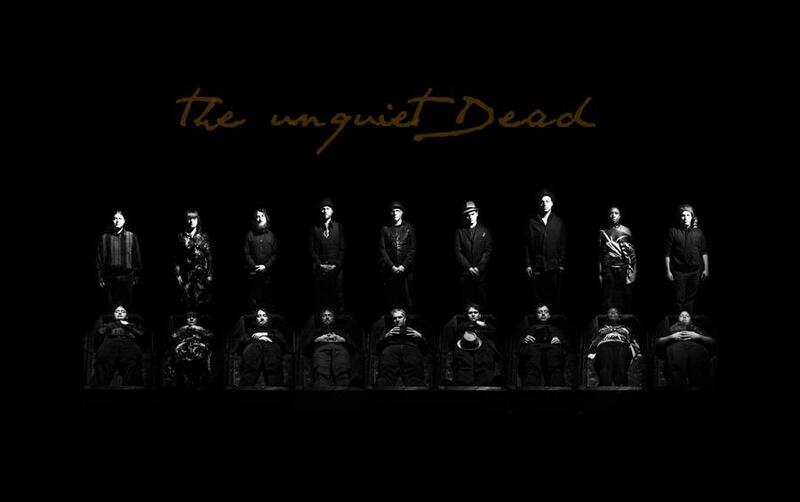 The Unquiet Dead is a collective of 12 of the most talented musicians Windsor’s music scene has to offer. Some of these musicians have decades of experience, others a lot less than that. They’ve all been in countless bands that you may or may not have heard about. The collective pedigree of the band has been enough to already launch them to the top of the heap in Windsor, having just opened for Elliot Brood, and they are on the verge of having their debut album release with the Schomberg Fair and Pat Robitaille. I had their debut Toronto show for the Black Hat Brigade reunion show and all I can tell you is that they are an absolutely enthralling act to watch live. You’d think fitting 12 people on the Rancho stage would be difficult, and you’d be right to have that concern. But it’s not a problem when you have 12 pros like these — lined up in three rows, this blues-twinged country-folk-gospel outfit hit the stage in perfect unison. They don’t have six guitars or anything crazy like that. Instead, many of the members bring percussive elements to the band, and plenty are singing vocals and backup vocals throughout. It really is a powerful performance sonically, emotionally, and visually as you watch these 12 passionate musicians pour their hearts out into these powerful, almost guttural songs. These are 12 musicians who wouldn’t take no for an answer. 12 musicians who’ve been through everything there is to go through in the music industry, including band breakups, huge highs followed by terrible lows, and anything you can imagine in between. It would have been easy for any combination of this band’s members to have just walked away from music or started playing solo here or there just to scratch the itch, but they weren’t having that. Instead they kept playing and eventually found each other, and that’s how the Unquiet Dead came to be. Take a listen to “Hard Road” on the band’s Facebook page to get a feel for what I am talking about. If nothing can stop the Unquiet Dead, then does that not mean the sky is the limit for this band? Come find out on Weds March 21st at 9 PM sharp at the Rancho Relaxo. You can see the full lineup for the night here. Just scroll down to Rancho Relaxo. Hot tip: if you don’t want to pay a service charge just show up nice and early (doors are at 7:30) and you’ll get in for just the flat $10.